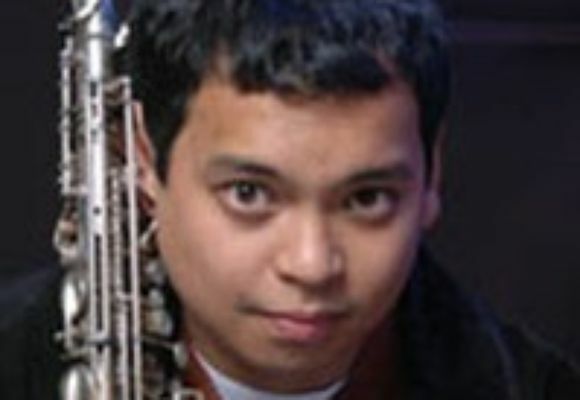 The sounds of yesterday, today, and tomorrow are generated from the mind and soul of Julius Tolentino. With sophisticated technique and skilled interpretation, Julius creates a sound that is unique while also based on tradition. Composer and performer, Julius builds a rapport with his audience and strives to produce an authentic portrayal of jazz music. Born in Bloomfield, NJ, Julius started studying piano at the age of 7. He continued his musical endeavors, which included clarinet when he was 10. By 13 Julius made the transition to alto saxophone. It was with this instrument that Julius began to explore his love for jazz. While in high school, Julius performed in regional and all-state bands and won over a dozen soloist awards. To further his musical career Julius applied to the Hartt School of Music with the desire to study with jazz legend Jackie McLean. Julius was pleased to learn of his acceptance and scholarship to the program. Upon graduation Julius moved to New York and has continued his career performing with Philip Harper, Antonio Hart, Vanessa Rubin, Cecil Bridgewater, Charlie Persip, Dion Parsons, Eric Reed, Marcus Printup, Craig Handy, Billy Drummond, Wes Anderson, Wycliffe Gordon, The Duke Ellington Orchestra, Kevin Mahogany, Christian McBride, Natalie Cole, Cecil Brooks III, Kioshi Kitagawa, Marleena Shaw, and Cyrus Chestnut. In 1999 Julius joined the highly acclaimed Illinois Jacquet Big Band performing, touring, and recording with the jazz legend for 5 years. Julius was chosen to be a part of a recording (Sharp Nine, "On The Loose") showcasing the young lions on the New York scene released in 2001. His debut recording "Just the Beginning" (Sharp Nine '05) recieved rave reviews and peaked at #8 on the jazz charts. Since then he has toured all over the US, Europe, South America, and the Middle East.